Following torrential rain over the last two summers causing water logging and missed matches at bowls clubs all over the country, the race is on, during the off season, to take remedial action. Terrain Aeration treated six greens recently in seven working days, starting in the West Country. 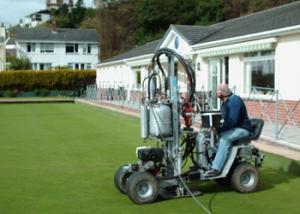 Braunton Bowling Club in Devon had suffered water logging on all its eight links and was the first to receive one metre deep compressed air de-compaction treatment via one of the company�s three Airforce Scamper Terralift machines. "On a bowls green the machine is set up to ensure that there is just a slight movement on the top surface to show that the soil has fractured from one metre depth all the way up," says MD David Green, who designs and builds all the Airforce Terralift machines. "There has to be enough air pressure to inject the dried, milled seaweed, which is vital in this one metre deep aeration process, but not enough to disrupt the surface." Once injected the seaweed sticks to the walls of the underground fractures and fissures created by the main air blast, and swells and contracts with the soil�s moisture content helping keep the fractures open. South Molton Bowling Club also in Devon was next to have its green treated and secretary Mr. Saxton, reporting after heavy rainfall says that there is a noticeable improvement in the time taken for water to drain from the surface. Buckfastleigh Bowls Club was followed by Plymstock Bowls Club whose greenkeeper Fred Birch had visited South Molton the previous day and talked to the greenkeeper. "It's been raining all summer and most of the bowling season," Fred explains, "and we've lost a lot of matches. We've got 18 inches of top soil, a layer of clay and then shillet. Our green like many in the area was not constructed in the conventional manner." Terry Philips of Avon Sports, who works with Fred and bowls clubs throughout the South West had also spoken to greenstaff at South Molton and recommended the Airforce Terralift treatment. The same day, Terrain Aeration were treating Waddesdon Bowling Club in Aylesbury and arranging for a second team, working in Wales to visit Merthyr West End Bowling Club. "We're home to the biggest Open Bowls Tournament in the country" says Chairman John Davies, "with over 250 players and total prize money of £4,000. The tournament takes place on August Bank Holiday weekend and the week before it was so wet that there was no bowls played on the green at all. Our secretary had many sleepless nights. Terry Philips recommended the Terralift Aeration treatment and we thought we'd take remedial action now to stop this situation happening again."